As of late my thrifting efforts appear to be lacking in the quantity department. That being said, there appears to be a surplus of quality in the small mix which I have accumulated. 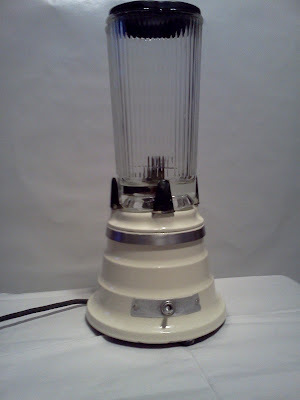 First on the table is this vintage Juice-o-Mat. Chipped to perfection, it works wonderfully for getting every last ounce of juice out of those pesky little oranges. My only complaint is that in doing so, it eliminates pulp. 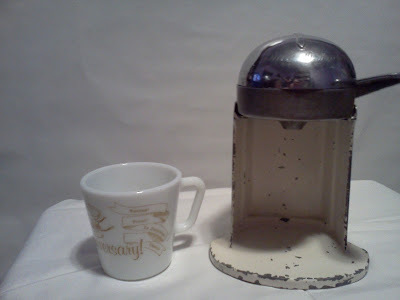 None the less, I believe it is positively adorable and will look at home next to the Waring blender I had previously found (more on that later). Although I'm not usually one for stray mugs, this one caught my eye. It says "Happy Anniversary!" on it as well as congratulations in various languages. My research leads me to believe it is from the 1970's. I had never saw anything quite like it before and considering the price, I couldn't quite pass it up. 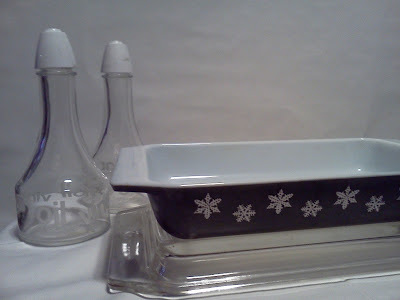 Next up is something I was quite tickled with: a white on black Pyrex snowflake casserole. First and foremost I absolutely adore this particular size. Also, I had never found a black and white Pyrex piece before, so to see this lil pup sitting on the bottom shelf (with lid!) tickled me to pieces. Although the condition is not quite perfect (there are a few minor chips and the black is dull as opposed to its original shine), I couldn't quite be picky for the price. Also pictured are a set of Gemco oil and vinegar cruets. I can't really say I know much about this particular brand, but I did like the simplicity of them...they were also both there, a plus. Finally for the big reveal: The old however slightly improved from it's messy-unoriginal-odd yellow paint job, the Waring blender.